The 4A Wolverines are the best 0-4 team they’ve played. Coach Andy Miles’ Wolverines battled through another tight contest Thursday in Hailey and just came up short 65-58 to the unbeaten Buhl Tribe (5-0), a tight squad averaging 59.0 ppg in the early going. The setback came two days after a one-point Wood River overtime loss at Gooding (2-1) and one week after a 77-71 home OT loss to Kimberly (2-1)—those two games sandwiched around a 66-49 loss at Filer when the fouls were out of whack and free throws settled the game. Two obstacles stood in Wood River’s way Thursday. Biggest was Buhl 6-4 senior Kade Crossland (24.5 ppg), the smooth-shooting star who tallied 13 of his season-high 32 points in the fourth sparking the late 26-point Tribe surge. Crossland added 9 rebounds, two 3-pointers and shot 10-for-11 from the line. Crossland, who has now scored 20 or more points in all five Tribe games, is the only senior on coach Dan Winn’s young Tribe squad that relies heavily on five sophomores. The second obstacle was the loss of Wood River’s 6-3 senior forward Eron Bates (14.3 ppg). He landed hard on his left elbow with 2:32 left in the first quarter and didn’t return. Miles said, “X-rays were negative, so there is no fracture, but Eron has his arm in a sling and we’re not sure if there is tendon or ligament damage. He was already playing with a bone bruise on his right elbow. With Bates (2 points, 2 steals, 1 assist in limited time) playing a big role, Wood River started off in a sharp offensive flow in the first and also used tenacious, in-your-face man-to-man defense for a 16-7 lead. Five different Wolverines scored field goals in that span. Bates went to the locker room with his team ahead 16-9. That’s when Crossland (8 points 1st period) started heating up, and Buhl went on an 8-0 run ending the first quarter to trail only 16-15 at the break. Crossland added 9 points including both his 3-pointers in the second. The Wolverines struggled to regroup without Bates. Miles said, “It took us the whole second quarter.” Buhl led 29-24 at half. At half, Miles encouraged his team to pick up the pieces. Wood River made an impressive rally in the third quarter ignited by its playmaker Arthur Brugger, the 6-3 junior from Brazil. After top scorer Cody Carter (15.5 ppg) opened the scoring with an 18-footer, Brugger’s passing and scoring carried the Wolverines on a 13-0 run. Penetrating and finding the open man, Brugger didn’t score a point but handed out six assists and blocked a shot in the first four minutes of the quarter. The play that brought the home crowd to its feet was a Brugger-led fast break that ended with a Carter dunk and a 36-32 Hailey lead. “Arthur has great vision. It’s amazing what you can do on offense when you have an effective pick-and-roll,” said Miles, whose team ended up shooting 56% from the field with only 14 turnovers. Carter (15 points, 8 rebounds, 1 block) scored 8 of his points in the third-quarter rally and continued to play solid defense on Crossland, who scored only one bucket, a putback, in the third period. Carter drew his third personal foul with 12 seconds left in the third and was in foul trouble most of the fourth, fouling out with a minute left. Miles assigned other Wolverines to guard Crossland, without much success. “Losing Cody hurt us on defense,” said Miles. Buhl (19-for-24 free throws) out-pointed Wood River 19-7 at the free throw line. Through four games, Wood River is 43-for-70 (61%) at the free throw line, compared to 87-for-134 (64%) for its four opponents. Other Wolverines were Connor Hayes (9 points), Kevin Hernandez (9 points, 1 block), Douglas Mason (8 points, 5 rebounds) Brugger (6 points, 2 rebounds, 10 assists, 1 block), Alec Nordsieck (4 points, 3 assists), Parker Bingham (3 points) and Jon Scott (2 points, 2 boards). Sophomores Michael Lively (12 points, 5 rebounds, 6 steals) and Hayden Eckert (11 points, 6 boards, 4 assists) were the other two Buhl players in double figures. 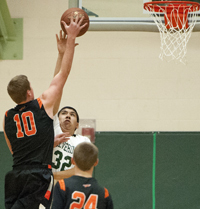 The Tribe out-rebounded Wood River 30-21 and had a very low total of 8 turnovers for the game. Miles has a chance to go up against his former high school coach today, Wednesday when the Wolverines visit Minico’s Spartans in Rupert for their Great Basin Conference debut. That coach is Ty Shippen, the 10-year Skyline of Idaho Falls boys’ basketball coach who replaced Adam Johnson as Minico’s head coach. The Spartans (2-2) opened with losses to Preston and Buhl (69-63), then won at Kimberly 55-43 Friday and lost at home to Hillcrest of Idaho Falls 73-41 on Saturday. Wood River High’s girls’ basketball team (4-4, 0-3 league) continued to struggle with its shooting (24%) in a 40-19 Great Basin Conference home loss to Twin Falls (6-2, 3-0) on Thursday in Hailey, but the Wolverines improved on the boards with a 20-18 edge. Samantha Sutton (6 rebounds, 2 assists) led Wood River on the glass. Other contributors were Ciceley Peavey (7 points), Blair Radford (5 points, 2 steals), Manuela Cortina-Otero (3 points), Kenya Schott (2 points, 3 rebounds, 3 assists), Rory Cole (2 points, 2 boards), Michelle Mason (3 rebounds) and Giselle Andrade (3 boards). Wood River traveled to Filer (7-3) Tuesday night and winds up its pre-holiday slate with a Great Basin game at Jerome (6-2, 2-1) on Thursday.